Finding new markets is a goal for most specialty crop producers. Chef David Bearl encourages growers to look no further than their own community to cultivate new relationships and buyers. That was the message he brought to attendees of the 2015 Florida Ag Expo. In particular, Bearl said many restaurants are looking to source local produce to feature in their dishes. But, what are chefs looking for in locally grown items? Freshness of the produce is critical to chefs and often is impaired by logistical challenges of getting the produce harvested, chilled, and transported in a timely manner. Another key first step in marketing local produce to restaurants is getting to know them. Bearl suggested growers map it out and see how many restaurants are in proximity to the farm and measure how far away they are. 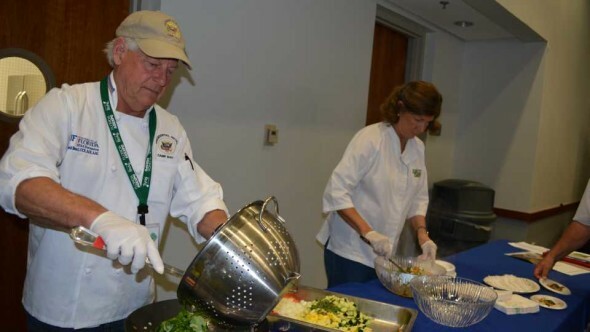 He also suggested getting involved with chefs’ organizations like the Florida Restaurant & Lodging Association and the American Culinary Federation. By getting involved, growers can learn what chefs who are buying local are looking for and then determine if those needs can be met. On the flip side, restaurants want to know the grower’s story. Bearl suggests growers develop point-of-sale materials that tell the farm’s story. Bearl said that food safety has to be a top priority for everyone involved, and good chefs are extremely mindful of good food safety practices.